All 16 of the 2017 pre-summit and summit MP3 interviews and workbook and transcripts. 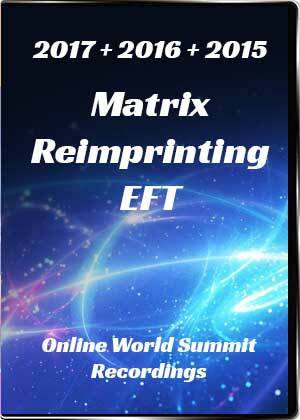 Interview and experiential exercises include Amit Goswami PhD, Carol Look on Eliminating Sabotage, Donna Eden on When Energy Medicine Meets the Matrix, Dr. David Hamilton on Mind Body Healing, Mark Wolynn on Ancestral Healilng, Johannes Fisslinger on Trauma as the Root Cause of Illness, Karl Dawson on the Magic of Matrix Tapping, Karin Davidson on Wonder and Weird Aspects of Matrix, Sharon King on Baby ACEs, Penny Croal on Conscious Living and Dying, and many more. All 14 of the 2016 pre-summit and summit MP3 interviews and workbook and transcripts. Interviewees include Lynne McTaggart, Gabor Mate, MD, Karl Dawson and many more. All 17 of the 2015 pre-summit and summit MP3 interviews and workbook. These include conversations with Rupert Sheldrake, PhD, Bruce Lipton, PhD, Rollin McCraty PhD, and many more.